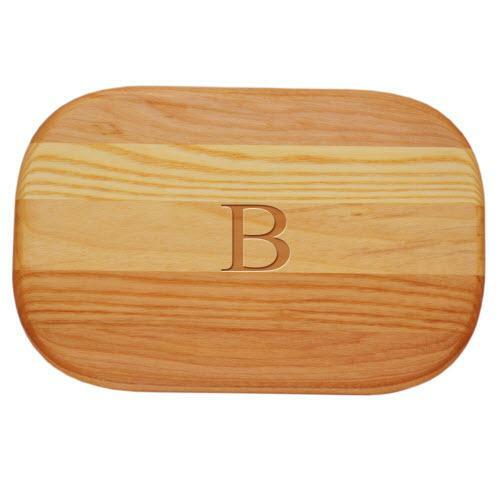 Personalized Bar Cutting Board 10' By 7"
These everyday boards and gift sets are perfect for the new house, the new kitchen, the wedding or anniversary, for the favorite hostess with the mostest, or as a refresher for your own kitchen! Made in Vermont, they have combined yellow birch with New England ash to give a subtle combination of color and grain pattern, creating a very attractive group of high utility boards. Rounded corners and rounded edges complete the friendly aspect of these designs. The three sizes offered are the result of customer feedback and are tried and true favorites. 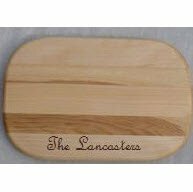 Small Everyday Board measures 10" x 7"x 3/4" thick (ship weight is 2lbs) and is perfect for those smaller cutting and chopping tasks. Care is simple: Wash in warm soapy water (the use of a nylon scouring pad is encouraged), then dry thoroughly. No dishwashers, please. Personalize to your desire below. INITIAL: A single letter, perfect for all occasions. Design your gift specific to the recipient's preferences. Select font style and enter desired initial. MONOGRAM: Monograms will be carved in the order you enter it (middle letter will be the larger of the 3). The monogram is a timeless classic! Select font style and enter desired monogram. NAME: The ultimate in personalization! Select font style and enter your desired name. Price: $36.00 In stock! - Browse this brand: Carved SolutionsOur products are custom made to your specifications. This product ships up to 2 weeks after your order is placed.